iOS users tend to do browse the web more on their mobile devices compared to Android users, reports ad network Chitika. While there are numerous different Android devices available, Apple users surf the web more using the iPad, iPad mini, iPhone and iPod touch. After comparing the data, Chitika found out that iOS users had a 67% market share in November, which is up by 2% since May. 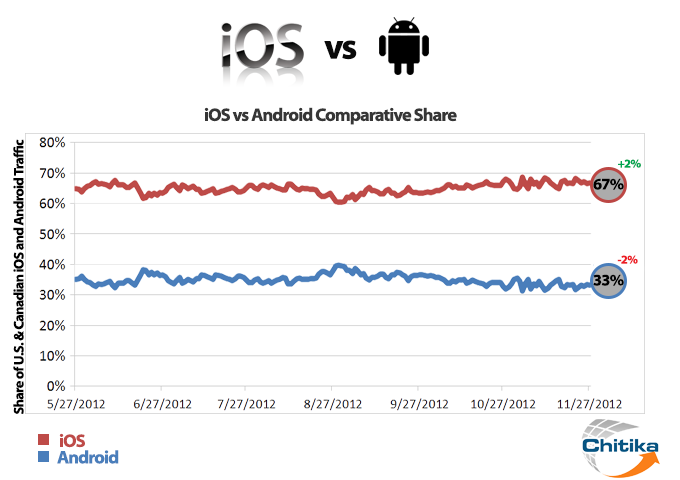 Android has lost 2% moving to 33% when recently measured. All of Apple’s devices provide a complete web browsing experience and deliver the web in its entirety. Chitika also reported that mobile users hardly switch OS versions when changing their devices. Users are highly loyal to one operating system over a period of time. Both Android and iOS users are browsing the web heavily and smart marketers are advertising their products and services to mobile users. Targeting has been made easier over time and advertisers can now easily target and even re-target their customers online using better channels and smarter methods.